South Africa moved up in the latest ICC Test Rankings after their stellar performance against Pakistan at home. The Proteas thrashed the Pakistani team 3-0 and leapfrogged England and New Zealand to reach the 2nd position in the ICC Test Rankings. 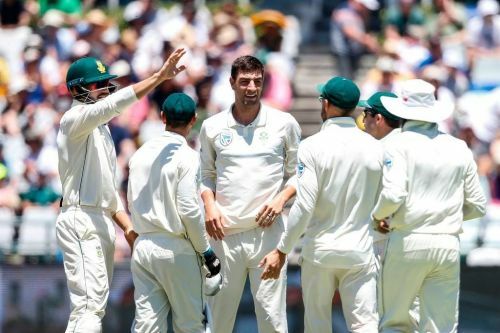 Duanne Olivier, the South African fast bowler who won the man of the series award for his 24 wickets, gained 29 slots in the rankings as has now reached a career-best 24th position in the ICC Test Rankings for bowlers, headed by Kagiso Rabada. His teammates Aiden Markram, Hashim Amla and Quinton de Kock also moved up in the rankings. Markram went up to the 8th position in the rankings while Hashim Amla too cracked into the top 10 after gaining 3 places to reach the 10th position. Wicket-keeper batsman Quinton de Kock has moved up by 12 berths to reach the 14th place. For the visitors, Babar Azam and Imam-ul-Haq have reached their career-best positions in the batsmen's rankings. Azam has gained 5 places to reach the 20th position while Imam has lifted 23 slots to a career-best 73rd position. In the bowling department, Mohammad Amir moved up by 3 berths to occupy the 31st position while his fast bowling partner Faheem Ashraf jumped 48 berths to reach a career-best 58th position. For table-toppers India, Virat Kohli continues to be at the top of the ICC Test Rankings for batsmen, followed by Cheteshwar Pujara at number 3. Among the bowlers, Ravindra Jadeja (5th) and Ravichandran Ashwin (9th) are the only Indian bowlers in the top 10. Should Sarfaraz Ahmed be banned for his racist comments?